Instructions: Remove skin from drumsticks and rinse drumsticks off. Mix oil and garlic in a 1-gallon zip-loc bag. Place six drumsticks in zip-loc and roll them around to coat in oil. Heat dutch oven to about 350 degrees for Baking. 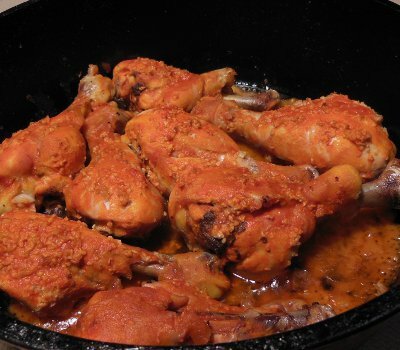 Place drumsticks in dutch oven. Coat remaining drumsticks in oil and place them in dutch oven. With a spoon, retrieve garlic bits from the zip-loc and sprinkle them over chicken. Bake drumsticks for about 30 minutes. Turn drumsticks and Bake about 20 minutes more. Turn drumsticks and spread hot sauce over each one. Bake about 15 minutes more.